With 121 quarter square triangles and 20 different colors of Kona Cotton arranged in a plus pattern...the Shattered Plus Quilt is finished! The finished quilt measures 67" square. The backing, which I regret that I did not take a picture of, is white pin dot on black. Nothing fancy, and I have had the polk-a-dot fabric in my stash for a long time. The binding, however, is fancy. I used the left-over fabric from the QSTs to make the binding just as colorful as the quilt top. I used Hobbs Heirloom Premium 80/20 Cotton Blend Batting for the first time on this quilt. I figured a loftier batting would make the quilting pop more, and it sure did. I also used gold Isacord thread for the all-over free motion swirls. Gold is the new neutral in case you haven't heard. I just made that up. And since I never feel like adding labels to my quilts, I have decided that I should just quilt my signature into the quilt. :) My last d is a little cut off by binding, but oh well. 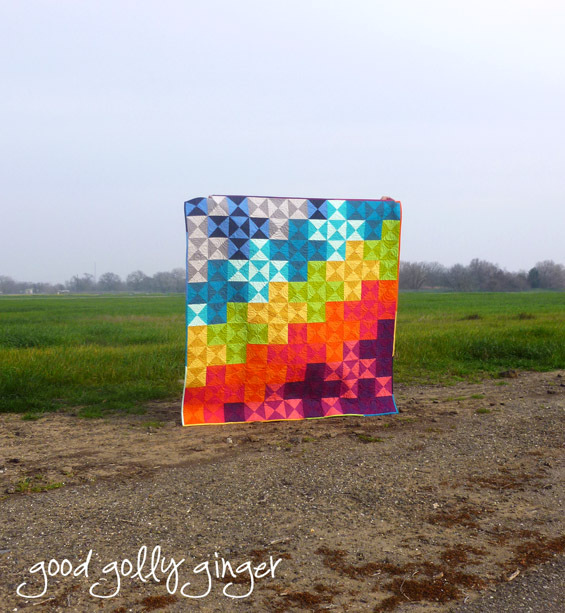 Are you the quilt police?! At least I signed it, right? And it's better than just signing with permanent fabric marker. 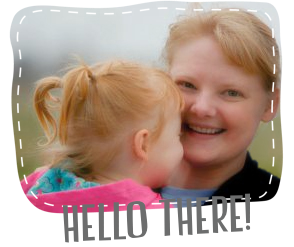 Thank you all who have commented and said hello since the Grow Your Blog Hop post. I am so thankful for all the new followers and loyal readers, and I apologize for not responding very quickly to all the new and sweet comments. I'm working on that, though. The Aurifil thread giveaway is still going on here until February 15. This is a beautiful quilt, Katie! I love the first photograph of it here; stepping back from it really emphasizes the colors and pattern - lovely! Whoa! This is gorgeous. If this was my quilt I would smile every time looked at it haha. And those swirls are perfect, love the gold thread. Such pretty colors. I love how you finished it, the scrappy binding is perfect! I love this! Taking a basic block pattern and making it a whole lot more than basic. Perfect. So beautiful and worth the time and effort. And I bet that backing is a wonderful contrast. What a beauty! And I love the way you've signed your quilt. I may start doing that, too, as I hate making labels as I think they are so distractive. Congratulations! it is really lovley - like the scrappy binding a lot. What a great idea to use the hourglass blocks to create pluses! I love it! You did a terrific job. Love the colors!!! Awesome! I love the colors. I didn't even notice the plus design on you earlier posts. The quarter square triangles are just too cool. 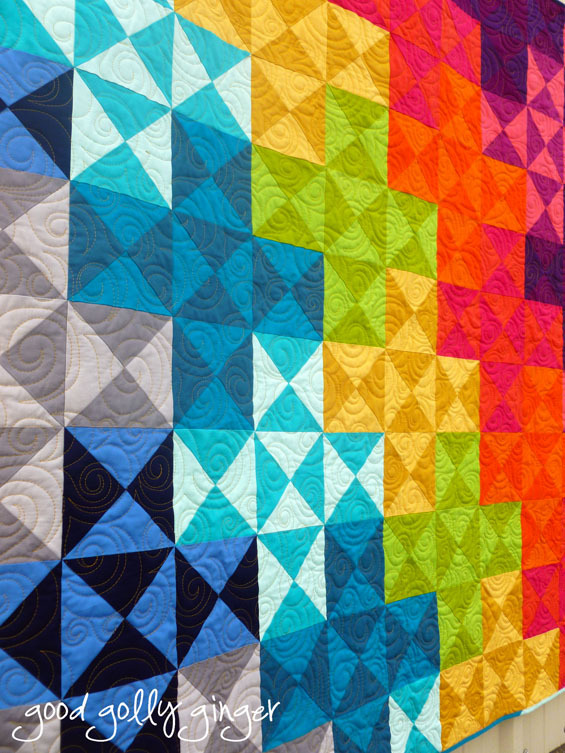 beautiful color scheme, and i love how the quilting looks with it as well! Love, love, love this quilt. 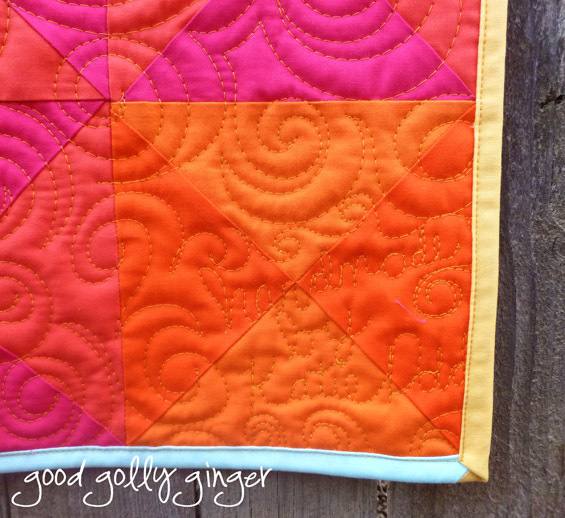 Your colour palette is so cheery and the quilting is perfect. I never would have thought of that motif with those blocks. Thanks for linking up with TGIFF! Well this is just beautiful! You have some amazing fmq skills! Gorgeous quilt and amazing quilting! You go, girl! I love the colors and the movemet you have created by color placement. The binding is perfect for the quilt. What a fantastic creation! What a beautiful quilt. I do like the idea of your "signing" using your quilting. I think quilts should be signed and dated some how for future folks.... so that is a Non intrusive way! So striking! 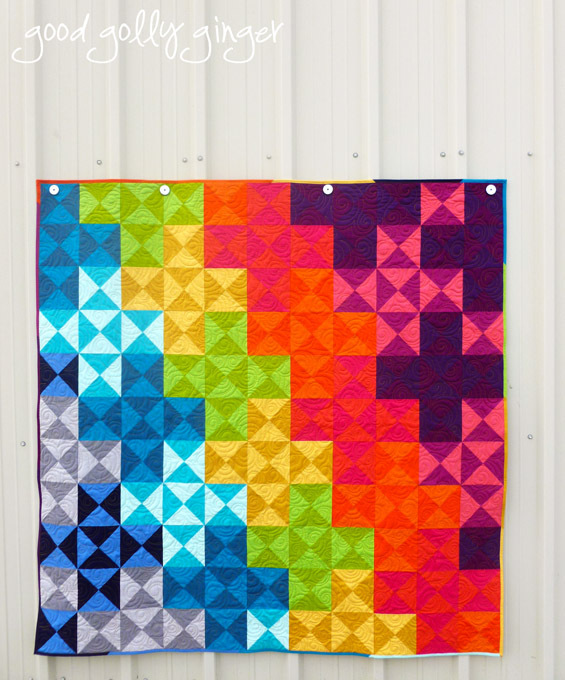 It looks like a different quilt when the orientation changes - beautiful, no matter how you look at it! Your quilt is stunning! The quilting looks great and I love that you signed it in thread. Your color pairings are just beautiful. I only just learned to quilt and hope to stick with it. Thanks for your inspirations.